Sweet, adorable Jack was brought to the Arizona Humane Society at the end of August when his previous owner’s pets did not get along with him. 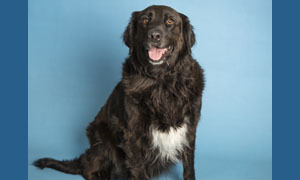 The 5-year-old Newfoundland/Golden Retriever mix is hoping the right family can give him the forever home he so longs for. Extremely smart, the awesome Jack knows how to sit and come and is also potty-trained. He also considers himself a connoisseur of belly rubs and will roll over anytime to test how well you can give them. Sweet and cuddly, the big boy also loves to give kisses and will remind you to keep petting him when you stop by gently pawing you. Meet Jack by visiting him at the Arizona Humane Society’s Sunnyslope Campus, located at 9226 N. 13th Ave. His adoption fee is $300 and includes microchip and vaccinations. For more information, call 602-997-7585 and ask for animal number 584548.